Handy for mounting some ESCs (i.e. KISS) directly. Handy for attaching connectors to the front and rear ports to LEDs. The goal of the CleanHawk 250 PDB is to simplify wiring and improve integration and reliability. 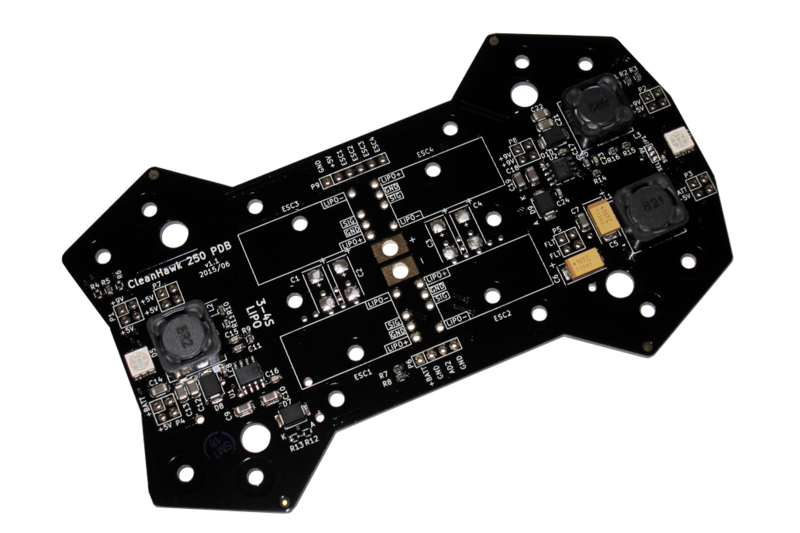 The printed circuit board replaces the bottom carbon fiber frame support on the Emax 250 / Nighthawk 250 quadcopters and drones. Designed for KISS 18A ESCs, ReadyToFly/Witespy's BearHug should fit just fine, and have pads for traditional ESCs. Hoping that the new Emax BLHeli Oneshot ESCs fit. 3A @ 5V for flight computer, OSD, and LEDs (i.e. WS2812), telemetry/BT, etc. (85%+ efficient). (6) RGB LEDs. 4 on bottom, 2 on top (not sure if top will be useful). Testing waters here. User configurable color by changing resistors. Plan is to do red on the rear and white up front. Multiple soldering points for accessories on the VBAT, 9V, and 5V rail. Helps to contain the wiring mess. Battery voltage divider for dividing the voltage down to something manageable for the Frsky D4R-II. Optional bulk capacitance near the ESCs to help smooth out ripples. 2oz copper for efficiency and electroless nickel immersion gold plating for solderability. Shielded inductors to reduce switching power supply noise. 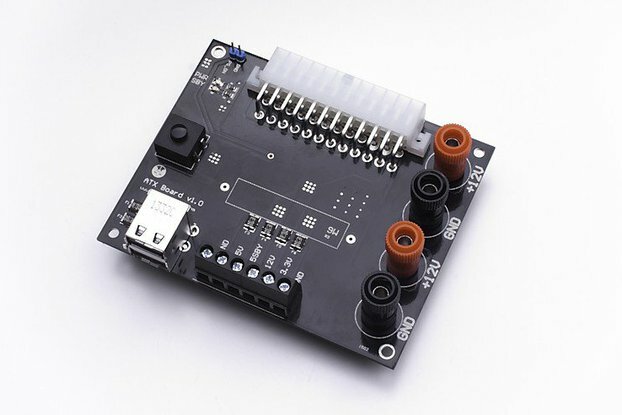 (1) CleanHawk 250 Power Distribution Board with all surface mount components installed. Note: USPS First Class International shipping doesn't offer tracking information after it leaves the United States. As a result, I can't guarantee delivery or help resolve lost mail. If this is a concern for you, please contact me to investigate alternative shipping options with tracking. To date no packages have been lost, but some have been severely delayed due to things like the postal service in the destination country being on strike. Please allow up to 45 days for delivery, less then 14 days is typical. Bottom of board: Exposed solder joints and surface mount LEDS - seriously, why?Are ALL open to the elements and contact with nice wet shorting grass... and rocks and stuff... so either 3D print yourself some sort of transparent guard or just coat the entire underside in something like liquid electrical tape to help prevent damage to this pcb. PDB neatens and tidies wiring. Onboard BEC. The quality of the board is exceptional. It's everything that it has been touted to be and is a great way to cleanup you wiring and simplify things. Soldering was a little difficult as heating the board sufficiently to draw the solder through can lead to the solder bleeding to the next closest hole in some parts. Overall, I'm very happy with the board and would recommend it highly. This power distribution board makes for a really clean build with the Emaxx nighthawk 250. There are tons of 250 class racers out there, for the money this frame is a no brainer. This IS the only purpose made Pdb for the nighthawk and it works great. 5 or 9 volt filtered power for your camera and vtx ensures a clean signal. 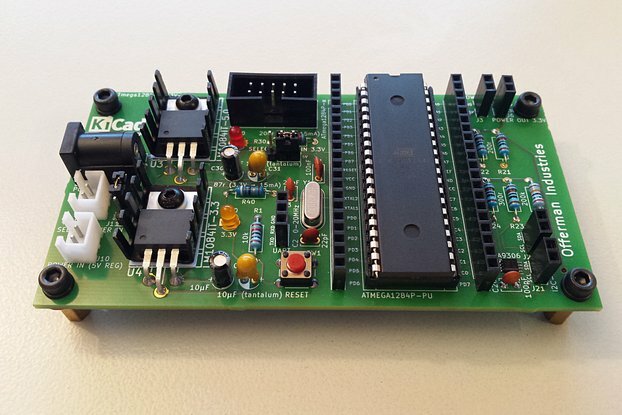 There are multiple auxiliary pads that you can tap into for anything, LEDs, Osd , etc. The documentation provided on github is well done and won't leave you scratching your head. If you do have any questions about the Pdb there is a thread on rcgroups and the designer, builder is on there all the time so there are answers. This is a great power distribution board for a great budget frame that makes for a clean build.